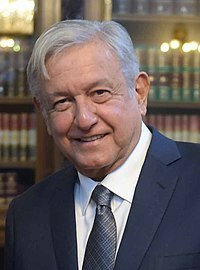 The President of Mexico (Spanish : Presidente de México), officially known as the President of the United Mexican States (Spanish : Presidente de los Estados Unidos Mexicanos),  is the head of state and government of Mexico. Under the Constitution, the president is also the Supreme Commander of the Mexican armed forces. The current President is Andrés Manuel López Obrador, who took office on December 1, 2018. 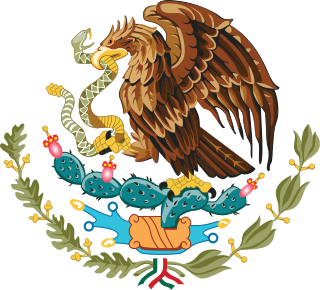 The Constitution of Mexico, formally the Political Constitution of the United Mexican States is the current constitution of Mexico. It was drafted in Santiago de Querétaro, in the State of Querétaro, by a constitutional convention, during the Mexican Revolution. It was approved by the Constitutional Congress on 5 February 1917. It is the successor to the Constitution of 1857, and earlier Mexican constitutions. Sexenio is the popular term for the term limit on the President of Mexico. The president is limited to a single six-year term, and no one who holds the office even on a caretaker basis is permitted to run for or hold the office again. It is one of the country's most important political institutions because it is one of the few significant limitations on executive power in Mexico, which is strong at local, state, and national levels. The sexenio is seen as a reaction to the failed experiment of re-election in Mexico during part of the Porfiriato era (1876–1911). In addition to restricting the presidency, state governors also face this restriction; no one elected as a governor may ever hold the post again, even on an interim basis. Former President Felipe Calderón won with 36.38% of the votes in the 2006 general election, finishing only 0.56 percent above his nearest rival, Andrés Manuel López Obrador (who contested the official results). Former President Vicente Fox was elected with a plurality of 43% of the popular vote, Ernesto Zedillo won 48% of the vote, and his predecessor Carlos Salinas won with a majority of 50%. The most recent former president, Enrique Peña Nieto won 38% of the popular vote. The current President, Andrés Manuel López Obrador, was elected in 2018 with a modern-era record of 53% share of the popular vote. Felipe de Jesús Calderón Hinojosa, is a Mexican politician who served as President of Mexico from 1 December 2006 to 30 November 2012. He was a member of the National Action Party for thirty years before quitting the party in November 2018. The Mexican Presidential sash has the colors of the Mexican flag in three bands of equal width, with green on top, white in the center, and red on the bottom, worn from right shoulder to left waist; it also includes the National Seal, in gold thread, to be worn chest-high. In November 2018, a reform was made on Article 34 reordering the colors of the sash. A new sash was made putting the colors of the sash back to the previous order that was used from 1924 through 2009. In swearing-in ceremonies, the outgoing President turns in the sash to the current President of the Chamber of Deputies, who in turn gives it to the new President after the latter has sworn the oath of office. The sash is the symbol of the Executive Federal Power, and may only be worn by the current President. Since the beginning of his term, the official residence of president Andrés Manuel López Obrador has been the National Palace, a building facing the Mexico City Zócalo . The President also has the use of Chapultepec Castle, formerly an Imperial palace of the Second Mexican Empire, and afterwards the official residence of Mexican Presidents until the Presidency of Lázaro Cárdenas in 1937. Along with Felipe Calderón, three other surviving former presidents (Luis Echeverría, Vicente Fox, and Enrique Peña Nieto) still live in Mexico. On June 30, 2006, Echeverría was placed under house arrest under charges of genocide for his role as Secretary of the Interior during the 1968 Tlatelolco massacre. The house arrest was lifted in 2009. Víctor Manuel Camacho Solís was a Mexican politician who served in the cabinets of presidents Miguel de la Madrid and Carlos Salinas. Born in Mexico City to Manuel Camacho Lopez and Luz Solís, he belonged to the Frente Amplio Progresista. At first he was affiliated with the PRI, later with the Party of the Democratic Center and then with the Party of the Democratic Revolution. With President Carlos Salinas de Gortari's economic and political reforms, the NAFTA agreement, Mexico was getting propelled as an important player in the world economy. When an unsolved ethnic situation was brewing in the Mexican county, that is when the Zapatistas uprising happened. The Mexican Government started immediate peace talks. In the early days of the new government administration, President Ernesto Zedillo took a series of erratic decisions that completely broke with the previous administration's agreements and with his own action plan previously defined. ↑ "Enrique Pena Nieto wins Mexican presidential election". The Daily Telegraph (London). Retrieved 12 December 2012. ↑ Buckman, Robert T. (2007). The World Today Series: Latin America 2007. Harpers Ferry, West Virginia: Stryker-Post Publications. ISBN 1-887985-84-0. ↑ El Debate (September 14, 2018). "Oficial: Eliminan pensión de ex-presidentes" (in Spanish). Debate. Retrieved December 2, 2018. ↑ "Felipe Calderón regresa a México para "supervisar" al Partido Humanista". SDP Noticias. Retrieved 2014-07-07. ↑ "Felipe Calderón regresó a México, confirma su esposa". Proceso. Retrieved 2014-07-10. ↑ "Echeverría, bajo prisión preventiva domiciliaria - El Universal - México". El Universal. Retrieved 2012-09-19.